Popeye the Sailor: Seafarer. Prizefighter. Exhibitionist. What do you know, Popeye and John Quincy Adams have something in common. Who knew it would be outdoor bonding. 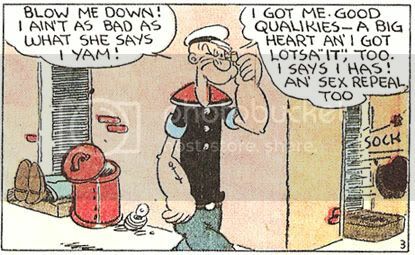 Segar's Popeye was surprisingly adult. If Olive is a submissive, that explains the whole "going with Brutus then going with Popeye then going back to Brutus even though she knows what he's like" deal. The relationship dynamic in the comics is interesting: typically in comics, the woman pressures the man for marriage, which he resists (see Superman/Lois Lane). This sets up a dynamic that leads to the woman being in opposition to the audience: marriage represents change, a threat to the heroes' adventures, which the audience doesn't want. So we don't like or identify with the female lead nearly as easily as we could. 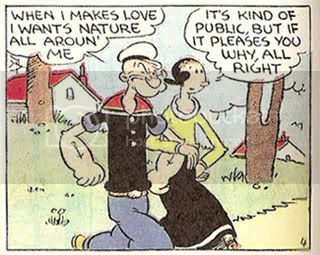 In the Popeye comics, it's the other way around: Popeye wants to marry Olive. But he's too much of a roughneck to change his ways, and he's constantly out shooting craps, getting into fights, and neglecting her for lowlife friends. He loves her deeply, and it hurts him when they quarrel, but though he tries he can't change his nature. This is a much better character dynamic: we want Popeye to be happy, so we cheer him trying -- but we like seeing him the way he is, so we enjoy watching him fail... and his and Olive's disappointment at his failures make us love the character all the more. It's really quite ingenious. Oh, my gosh. I knew those comics existed, but I hadn't really paid attention them. Man! I love that. Although, I will admit that my first exposure to Popeye was a) the cartoon, but especially b) the movie with Robin Williams, which I ADORED when I was little (and still enjoy because it's goofy and sweet).